Besides daily dishes we have Osechi or new-year-day dishes adding colors to the new-year-day cuisine in Japan, which are hearty, traditional tastes. 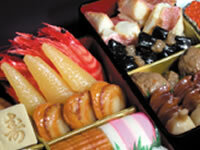 The picture at left shows samples of Osechi or new-year-day dishes appreciated on the new- year days in Japan. Osechi including European dishes or Chinese dishes has also been becoming more popular, besides that including Japanese dishes. Regardless of Japanese dishes, European dishes, or Chinese dishes, our food samples of Osechi reproduce the brilliance and atmosphere of its materials. 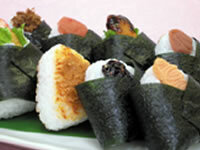 Shown at left is the picture of Osozai or side dishes and Tsukudani or preserved cooked fish or vegetables. We produce not only their shape samples but also those served on a dish, according to the request by our customer. 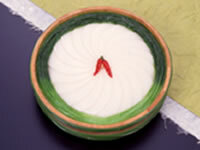 Pickles are sold at various places, which are also various in kinds and types. We produce food samples of pickles according to how they will be displayed, such as those contained in a keg for a gift or those packed for a souvenir.